While traveling throughout Korea, there are many ways to get a glimpse of the nation’s traditions and culture; trying the food or visiting ancient buildings to name a few, but nothing compares to trying on hanbok, the traditional clothing of Korea. Although hanbok is generally only worn on special occasions or during national holidays, it is growing in popularity among young couples and international visitors. The eye-pleasing combination of straight and curved lines suits all body types. Visit cultural centers like the ones featured in this column for the chance to try on a beautiful hanbok for yourself! The styles of hanbok available and the rental fees will vary by each program so be sure to check in advance! Opened to the public in October 2006, the Insa-dong PR Center is a living museum of modern history and Korean culture. 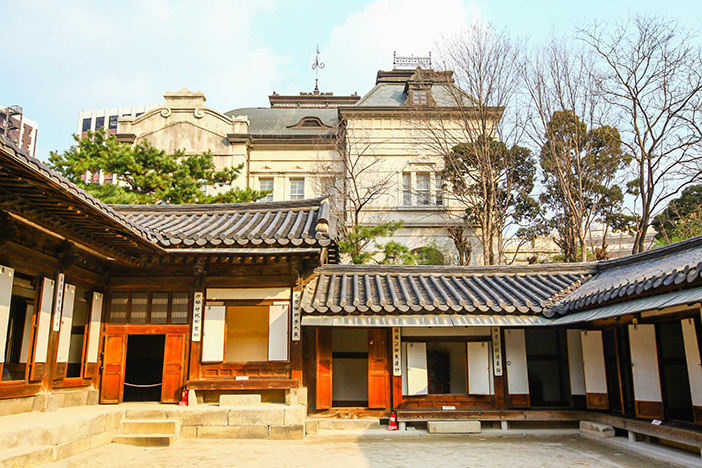 The hanok was originally built as a private residence for Prince Uichin (1877-1955), the fifth son of Emperor Gojong (1852-1919). Newly added features include on-site commentated tour guides and assistance in multiple languages (English, Japanese and Chinese available) in order to promote the understanding of Korean traditions and history among locals and international visitors alike. In addition, tourism leaflets, diverse cultural events such as trying on traditional clothing and musical performances are offered, as well as wireless internet access provided free of charge for all visitors. The center has a particularly wide selection of hanbok designs, including ones that were worn at the royal court, which feature colors favored by high-level officials, as well as lines representing various social classes of Korea’s past. Photos taken here have the added benefit of a beautiful hanok background to really complete the image. - Jonggak Station (Seoul Subway Line 1), Exit 3-1. Walk approx. 7min. - Anguk Station (Seoul Subway Line 3), Exit 6. Walk approx. 8min. - Jongno 3(sam)-ga Station (Seoul Subway Line 1, 3, 5), Exit 5. Walk approx. 10min. 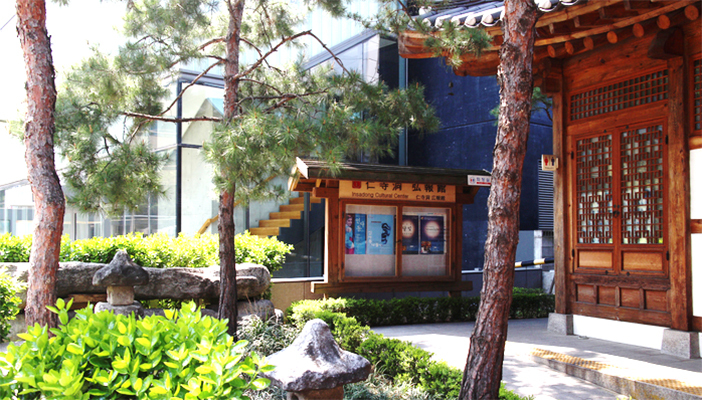 The most popular place for visitors to partake in a hanbok fitting experience is the Seoul Global Cultural Centerlocated in the heart of Myeong-dong. The staff members speak English, Chinese, and Japanese, making it easy to enjoy your experience. Choose from a guard’s uniform just like those worn at Deoksugung Palace Royal Guard-Changing Ceremony, the formal dragon robe of a Joseon Dynasty king, a royal serving girl or any of the other hanbok designs that catch your eye. The center also has a variety of traditional accessories such as kkotsin (flower embroidered shoes) and a Korean bridal crown to go along with your selection. Take snapshots of your experience before the large-scale photographs of the main rooms at palaces and traditional hanoks. - Myeongdong Station (Seoul Subway Line 4), Exit 8. Walk approx. 4min. - Euljiro 1(il)-ga Station (Seoul Subway Line 2), Exit 6. Walk approx. 7min. A traditional changing of the guards ceremony takes place every day of the week, excluding Mondays, in front of Daehanmun Gate at Deoksugung Palace, a palace of the Joseon Dynasty located in Seoul’s Jung-gu. 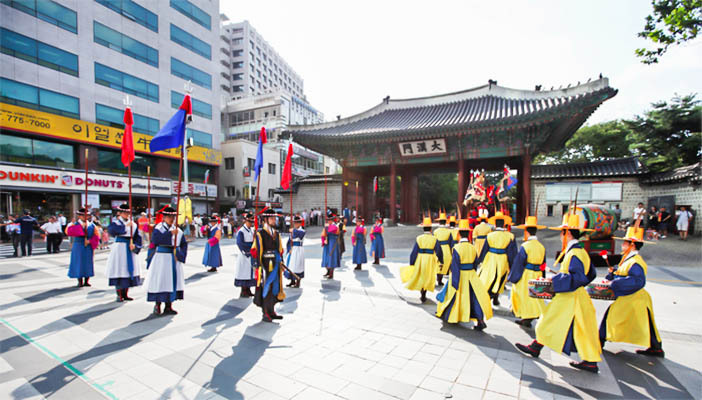 In addition to viewing the fascinating progression of the changing of the guard, visitors can also stop by the hanbok rental booth in front of the main gate to try on traditional guard uniforms and other hanbok for free. Just sign your name on the list and wait your turn, then the staff at the booth will help you try on the item of your choice. Given the opportunity to both witness the changing of the guard ceremony and pretend you’re a guard as well, it’s a popular attraction among international visitors. ☞ Directions: City Hall Station (Seoul Subway Line 1, 2), Exit 2. Walk approx. 2min. 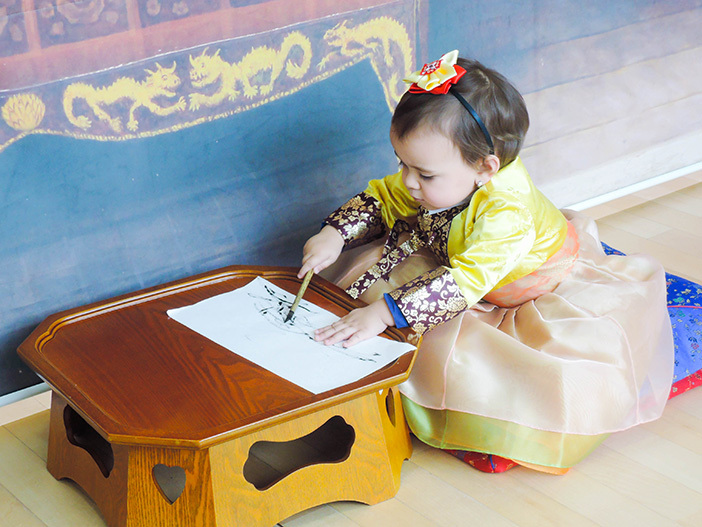 ☞ Operating hours (Hanbok experience): Tuesday-Sunday, 10:30-11:30, 13:30-14:30, 15:00-16:00 / Experience time: 10min. A hanbok experience program is available in the exhibition hall, located opposite the tourism information booth. 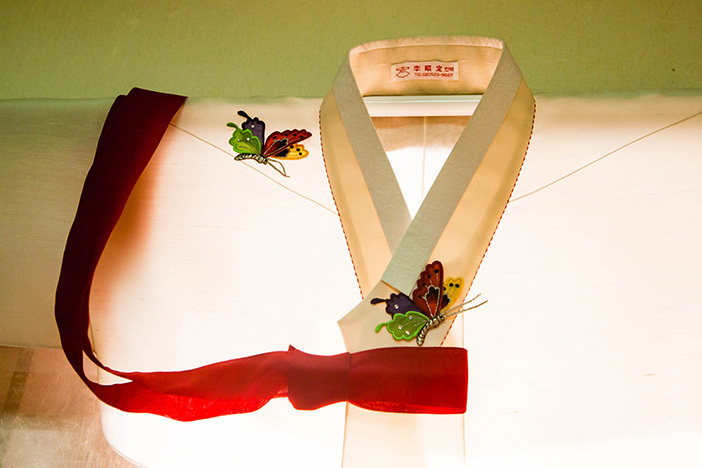 You can try on gwanbok, which was worn by officials, dangeui, a formal dress for women, or even hanbok for children. There are a plethora of gorgeous places for photos within the grounds of the palace. Customers can choose whatever clothing item they’d like to try, or ask for recommendations from the staff, and get about 20 minutes of wearing the clothes before they need to be returned for the next customer. Check on the center’s website to find more information about seeing performances and reenactments of the traditional wedding ceremony of King Gojong to his queen, Empress Myeongseong. - Anguk Station (Seoul Subway Line 3), Exit 4. Walk approx. 3min. - Jongno 3(sam)-ga Station (Seoul Subway Line 1, 3, 5), Exit 5. Walk approx. 9min. ☞ Operating hours (Hanbok experience): Tuesday-Sunday, April–October 10:00-18:00, November-March 10:00-17:00 / Experience time: 20min. * This column was last updated in July 2017, and therefore information may differ from what is presented here. We advise you to check details from the official websites before visiting.